I just received my order from GP today and I’m so HAPPY except I think I already did something wrong to my brand new TWISBI vac 700. Not sure if someone can help me (Brian, please?) FYI I’m a TOTAL newbie to fountain pens and am disheartened I can’t fill my new pen up with ink. I followed Brian’s “dance” video on the Vac700 overview and took the mechanism out of the pen barrel with the wrench (did so so I could learn about the pen and use the silicon grease) and now the part that slides back and forth is now “stuck” up into the the black cap part and I no longer have access the the notch where the wrench goes. And it won’t unscrew. I have no idea what I did wrong. OH MY GOSH, WHAT HAVE YOU DONE???? Haha, jk. Don’t worry, you haven’t done anything permanent. The knob screws onto the back of the rod, and the rod screws into the pen. 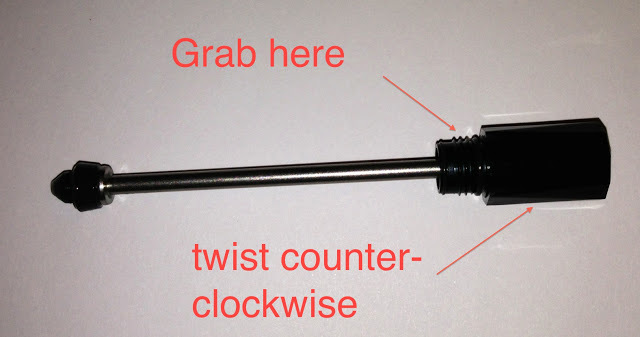 If you grab the part of the rod that has the threads exposed with your fingers, and turn the knob counter-clockwise, it should unscrew and reveal the notch that you need to put it back into the pen. Depending on how tight the knob is screwed on it may be a little tough to do, but that’s what needs to happen. TWSBI Vac-700 assembly, with the filler knob twisted stuck and covering the notch for the wrench. For years I’ve used the Koh-i-Noor line of Rapidograph pens and Rapiddraw or Universal Inks for drawing. The #0/.35mm, #1/.50mm & #2/.60 tips on the Rapidograph produce line widths which suit my needs. But, the clogging properties of those pens finally induced me to try a few old fountain pens I have on hand using Higgins Fountain Pen India Ink. The one which clogs the least using Higgins Fountain Pen India is a Shaeffer Medium steel tip. The problem is that it doesn’t have a converter, so I’ve tried filling old Shaeffer Skrip ink cartridges with Higgins, but they leak. Also on hand is a set of old Osmiroid drawing pens with fine, medium and broad points, but the Higgins ink doesn’t easily flow. As a consequence of the above, I researched and found the Noodler’s Ahab Flex Nib #6, and on your site found the line width for that pen. The width is broader than that produced by the Rapidograph #0/.35mm, #1/.50mm & #2/.60mm pens described above and is even perhaps broader than the Shaeffer Medium steel nib as well. for that reason the Ahab #6 is not a good choice for me, even though I like the description of the pen’s properties. Question: Given the above parameters, can you suggest an economical non-clogging alternative which can use dense black ink? I think the bigger problem you’re having is actually the ink, not the pen. Higgins is a shellac-based ink, which is made more for dip pens than fountain pens. 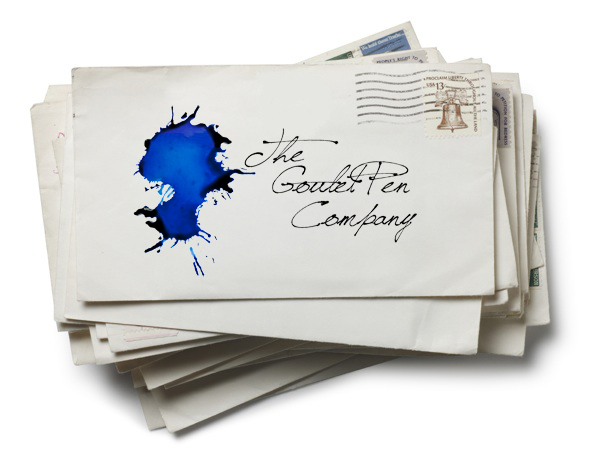 Fountain pen ink is water-based, and will flow MUCH better in your pen than your India Ink will. You will want to stop using India Ink in any fountain pen you use from here on out. The problem with shellac-based inks is that they’re thicker than water-based ones, so they will clog. 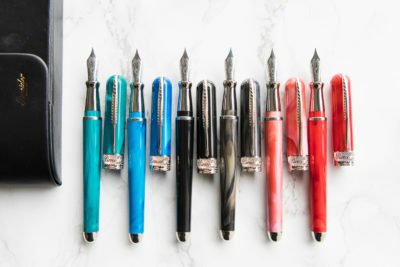 If they dry up in the pen, the only way to remove shellac is with alcohol, which also melts plastic, which is what most modern fountain pens use to make their feeds (and other pen parts), so if you try to clean the shellac out of your feed with alcohol, you will literally melt and dissolve it, which will obviously ruin the pen. I would immediately stop using that ink in your pen, flush it thoroughly with clean water, and try it with a water-based fountain pen ink (every ink we sell is water-based). If your pen is already clogging, it may just be because of the ink, but realize that if the ink has dried up in the pen at all, it may not be salvageable moving forward. All that said, if you’re using the right type of ink, you’ll find you have a lot of options for pens since none of them will clog like your pen does now with the India Ink. If you want a really dark black to use in your fountain pen, I recommend Noodler’s Black, Heart of Darkness, or X-feather. As for a pen, most fountain pens usually equate in their nib width to something like: fine = 0.4mm, medium = 0.6mm, broad = 0.8mm, so I would say you should stick to an extra-fine or fine nib. Fountain pens will write a little broader even with the same tip width as your Radiographs, because the ink used is more fluid and will absorb into the paper more. So it’s not an even swap for tip sizes, you’ll want to go as fine as you can with fountain pen nibs. The Ahab has a flexible nib, which is really a whole other situation, and would probably write much broader than you want. If you’d like to just try a solid inexpensive fountain pen, I’d recommend you start with the Pilot Metropolitan, it’s a great pen and you can get the basics of fountain pen use/maintenance down with it before investing heavily into anything else. 1) It’s clear from your description of shellac-based inks that using them in a fountain pen is a recipe for frustration and damage to the pen. My use of India ink originated with its incisive visual appeal and supposed archival quality. As as artist, I’m aware of the possibility of degradation over time of the materials I use and generally research them to avoid fading etc. 2) Since Noodler’s is a very highly regarded brand, I’m likely to be persuaded that it is a good replacement for what I have been using. But since it is water-based do I need to worry about so-called archival concerns? I see that the Noodler’s blacks you recommend are all water-resistant, but how do they compare in density and depth with India? 3) I looked up the Pilot Metropolitan on your website and found that the nib size for all pens on the page is medium. Is the Metropolitan offered somewhere on your site with a fine nib? 4) Finally, I spoke with your excellent telephone receptionist yesterday and explored options for the Ahab Flex Nib #6 because of its broad point. She suggested that I consider buying the Ahab Flex and a Goulet #6 Fine Nib which evidently is easily swappable with the Flex Nib. 5) In summary, it looks as though my choice for a workable alternative to my present practice is between the Metropolitan and the Ahab plus a Goulet nib using one of your recommended Noodler’s blacks? If the Metropolitan medium nib is greater than .60mm, it may be broader than I like. 1) You won’t have to worry about that with Noodler’s permanent inks. They are made to bond permanently to the paper. You can actually see the detailed breakdown of the archival and permanent properties of every Noodler’s ink in this spreadsheet we put together, so you can be sure what you’re looking at will be what you need. All three of the blacks we’ve discussed here are going to outlast you and me many times over. 2) I think you’ll find these three blacks to be as dark (or maybe darker) than your India Ink. One point of distinction though is the way the inks work…India Ink dries on top of the paper, and Noodler’s ink absorbs into it. So if you have very absorbent paper, the ink might look a little lighter or washed out because it’s soaking more into it. Another alternative for you might be Platinum Carbon Black. This is a pigmented ink that acts similarly to the India Ink in that it dries on the page instead of into it, and it is safer for fountain pens. It’s water-based, but gets its permanence from fine pigments in the ink instead of dyes. It will be more resistant to UV-fading, the only downside is you have to be a little more diligent about keeping your pen clean (though, not nearly to the degree that you’re used to with your India Ink now!). 3) It only comes in a medium nib, unfortunately. But it’s a Japenese brand, and they grind their nibs a little finer than Western pen companies. You can compare it to some other pens in the Nib Nook, it’ll write like most fine nibs. 4) That must have been Katy, she’s great! Yes, the Goulet nibs are swappable with the flex nibs on the Ahab and the Konrad, I have a video showing how to do that here. 5) I think you would be happy with the Metropolitan even though it has a medium nib. I don’t know the exact width, but I’d say it’s around a .5mm. X-feather or Platinum Carbon Black would be a good ink choice for you. OK, here’s a question for you, maybe one you’ve already answered, or maybe one so elementary that no one else will be interested, but …… When I only had one fountain pen (so far back I can’t now remember those bygone days) I just kept it lying flat on my desk, along with a pencil, gel pen and ballpoint, for easy access and quick grabbing. Now that I have — ahem — a few fountain pens, I need a better way to keep them from scattering everywhere, knocked onto the floor by my cats, and taking up space on my admittedly cluttered desk. I’ve seen a nice zippable leather pen case in some of your videos. I’m not sure I want my pens strapped down, but I would consider that as a nice tidy solution. But my real question here is, is it better to store (filled) fountain pens flat, or are they ok stored upright, as in some kind of cup-like container? FYI I live in a very dry climate, and although pens are kept capped, there may be some drying-out factor possible in the upright position. How strong is the capillary action that feeds ink to the nib? I did make a video on storing fountain pens, and you can see my own cluttered desk there 🙂 Honestly, you do whatever works best for you. I find that storing pens upright with the nib pointed up dries out pens, especially in a dry climate. So it’ll probably be best for you to store them horizontally or vertically with the nib pointed down. Your pens will probably tell you which they like better! Just as a side note, the length of time that a pen will stay wet will vary, I’ve used some that need to be cleaned out if I’m not using them for a week, others can go months. A lot of it depends on the pen design and how well the cap seals. I personally store just about everything horizontally and I find that works for me. About the capillary action, it’s quite strong. If ink is touching the feed, it will draw up to the nib, even upside down…however, if there’s any air in your ink reservoir at all, then it will go to the top when you have the pen stored nib-up, so except maybe immediately after filling your pen, the ink won’t actually come in contact with the feed if it’s stored nib-up. THEN, I found this blog/blurb at Rhodia Drive from January 13th of this year and it gave me some hope. This verbiage makes it sound like these will ‘eventually’ be made/distributed/imported again, but no ETA? Is that how you read it? Is that accurate from what you know? Anything you could share would be helpful. It would sure be nice if Companies would maintain “Discontinued” or “Pending” or some kind of Lists for their customers who can’t find something on which they are willing/eager to spend money? It’s good you emailed me, I actually know what’s up here 🙂 They came out with top-wirebound dotpads, and the dots were different than the other ones. They were fat and faded purple, instead of the small gray dots on the top-staplebound ones. Apparently, this was unintentional, and once Rhodia realized this is how they were going out, they stopped producing them (this was around mid-last year, I don’t know exactly when). So it’s possible some of these notebooks could be on retailers’ shelves, but not likely since they weren’t out that long and it’s kind of been a while since they were stopped. I was told at the time they stopped making them that they planned to bring them back, but this wouldn’t be an overnight thing. I wasn’t given a timeline, so at this point there’s just no eta for when they’re coming back. I personally like them and miss them, but I actually haven’t had gobs of people asking about them either…perhaps because they weren’t available all that long.